The Razer Naga’s revolutionary 12 button thumb grid has been outfitted with mechanical switches to give you tactile and audible feedback, so you can be assured of every actuation. The design of the thumb grid itself has also been improved with an all-new concave shape to allow each button to stand out individually. This allows for blind-find so you stay focused on the game, letting your instincts and reflexes lead you to victory. 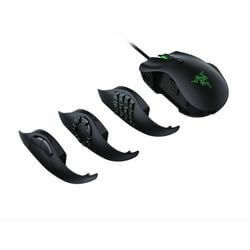 The scroll wheel on the Razer Naga now goes left and right, as well as up, down and in for more buttons at your disposal, whether for destroying games or navigating a lengthy forum for the best MMO strats. This iteration of the Razer Naga features an all-new one-size-fits-all ergonomic form factor to ensure your hand fits snugly for maximum comfort. Its size is perfectly crafted for all hand shapes and is still light enough to be easily lifted by low-sense MMO players. Introducing the most intuitive mouse configurator you’ll ever need for MMO gaming. Customize each and every button on the Razer Naga to your personal skillset, macros and hotkeys right from in the game via a non-intrusive overlay. The thumb grid can be visually displayed with icons right from your favorite MMO so you’ll know exactly what button to hit at all times.